MINNEAPOLIS (AP) P.J. Fleck has made the slogan ”Row the Boat” a way of life for him and the football programs he leads, a way of honoring his infant son Colt, who died from a heart condition in 2011. It’s not something that he could ever put a price tag on, but Western Michigan did: $50,000. The Minnesota football coach and his former employer reached an agreement Wednesday that will give Fleck legal intellectual property of the catchphrase he made famous in four seasons with the Broncos. As part of the deal announced by Western Michigan, Fleck will make a yearly gift of $10,000 to the school to support a football scholarship. The Fleck Family Football Scholarship will begin this fall. 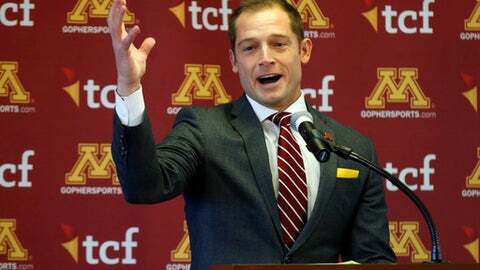 Fleck led the Broncos to a 13-0 regular season and a Cotton Bowl appearance against Wisconsin last season before leaving in January to become head coach at Minnesota. Fleck and the Broncos became a national story for their uncommon success, and the ”Row the Boat” backstory resonated. Fleck used the saying as a way to promote teamwork and sacrifice among everyone connected to the program and the community, saying that rowing a boat allows symbolizes remaining in the present while looking to the past and learning from it. Even though Western Michigan held the rights to ”Row the Boat,” there was little doubt that something eventually would be worked out to allow Fleck to bring it with him to Minnesota. The slogan is featured prominently on the wall of his office, construction workers building the team’s new athletic facility right behind the current football building scrawled it on a steel beam visible outside his office window, and the coach has finished every interview he’s done in the Twin Cities by uttering the phrase. New Broncos coach Tim Lester likely has little desire to copy a message so uniquely tied to his predecessor, and athletic director Kathy Beauregard said Western Michigan is still trying to determine how to both recognize the accomplishments of the team in four years under Fleck and move forward with new leadership. ”This agreement today allows us to celebrate the accomplishments of our student-athletes over the past four years,” Beauregard said.